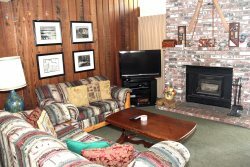 Standard 3 Bedroom & 2 Bath, Pet Friendly, 2 story town-home located in the heart of Mammoth Lakes on the red line shuttle near the Stove Restaurant & Vons Grocery Store. Sleeps up to 8. The master bedroom has 1 queen bed, the second bedroom has 1 queen bed, the third bedroom has 1 queen and 2 sets of bunk beds. 4 TV's. Living Room has a DVD, BlueRay and VCR. Each downstairs bedroom has a DVD player and the 3rd bedroom has a VCR. No phone in unit. No Sofa bed in unit. (aprox.1300 Sq. Ft. of living space). Some new furniture and mattresses November 2017. This is a 2 level town-home with the entrance on the first floor. The first floor has 2 bedrooms and 1 full bath, the second floor is the living room, kitchen, dining room, master bedroom and 2nd full bath. Washer/Dryer in the unit. There are two outside parking spaces available. Spa, Seasonal/ Summer Swimming Pool, and Sauna. COMPLIMENTARY INTERNET and CABLE TV are provided, however NO REFUNDS will be given for connectivity problems or Internet failure. No BBQ's allowed on the premises. No laundry facilities at Common Area. TOT LICENSE 3390-CB01. This was our second stay at this town-home and it did not disappoint! It was a comfortable space for our party of 8. The living room area sat us all comfortably for game night and the kitchen is extra stocked with plenty of utensils, glasses, and plates. We love that it is a corner unit and easily walkable distance from the center of town. There are beautiful walking trails near the unit as well. We also brought our pup along - super dog friendly! Perfect place for a large group! This place was a wonderful space for our group of 7. The upstairs and downstairs areas were spacious and gave some natural privacy for those who needed it. The entryway was awesome; we loved having an area to unload our ski/board gear apart from the common areas. The kitchen was stocked with the basic cooking tools and plenty of utensils to last several meals, though you might have to dig around a bit to find everything. We would definitely stay here again! Great place! Thanks a bunch! The unit was perfect! This was a great rental. Spacious, great location, great hot tub. Good quiet location. Walking distance to shops especially groceries at Vons. Ample parking for our 2 cars. Kitchen was adequate and nicely furnished. The wood stove was great and more than adequate in heating the upper floor. Carpets need attention. CRM Note: The owner is planning on replacing all carpets as part of a unit remodel in the spring of 2018. The central reservation was really nice, and a plus for having a pet friendly place. The host responded quick and was easy to communicate with. I will definitely stay here again if me and my family go back to mammoth. This was a super condo. We thoroughly enjoyed our stay. The close proximity to restaurants and grocery store is a gigantic plus. It is clearly walkable and a very pleasurable walk either in winter or summer. I would definitely stay here again. All the amenities were provided in the condo. It was a very pleasurable stay. Super condo. I have been coming to Mammoth for over 30 years and it was a pleasure to stay in this part of Mammoth. Enjoyed being close to restaurants and grocery store. The condo was extraordinarily pleasurable and with all amenities. I would definitely stay here again. One of the best spots Ive stayed at in Mammoth over the last 5 years. All the beds were comfortable, location was great, very clean, and nice open spaces. Especially good for 3 different couples as each one gets their own separate bedroom space.